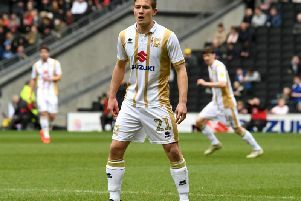 Captain Alex Gilbey said some players need to rethink their performances after defeat at Northampton on Saturday saw MK Dons drop into the relegation zone. The 2-1 defeat at Sixfields would end up being manager Robbie Neilson's last game in charge of Dons - he was sacked on Saturday night - after first half goals from John-Joe O'Toole and Chris Long, either side of Gilbey's equaliser. Despite being the better of the two sides in the first half, Dons barely registered a shot in the second period until late in the day. While George Williams, Chuks Aneke and Marcus Tavernier all drew saves from Cobblers keeper Richard O'Donnell, it was too little too late none could find the equaliser, especially after Aneke was sent off in stoppage time for his part in a fight with O'Toole. While fans were chanting for the manager's head during the game, Gilbey said the players had to face up to the responsibility that they were to blame for the team's poor league position. "Some people might think they're doing OK, but clearly we're not. We need to go away and work on it, come back fresh on Monday and get back to it for the FA Cup. "It's easy to point fingers, but it's the players at the end of the day. We're employed to be at our best and we're clearly not if we are where we are in the league. I told the lads to go and have a long hard look at themselves. "Every time we play well and move the ball, we batter teams and we should be beating them. I don't know if the pressure got to us when I mentioned the importance of getting three points at half time, but we stopped doing what we were doing." Dons now sit 21st in the table, having won just seven games all season, but Gilbey insists he and his team can get out of the drop zone, saying: "Everyone believes it, we all have to otherwise there's no point coming in. We're all on the same page, we just need to start performing." "In the first half we were good, we saw some really good link-up between George Williams and the new boy Tav (Marcus Tavernier). "In the first half that was the best we've been for a while. But we conceded and it took the wind out of our sails. They were sloppy goals. We're in a dog fight now and we need to win games." But with the FA Cup fourth round clash coming up against League 2 side Coventry City at Stadium MK next Saturday, Dons will be in the relegation zone for at least two weeks. And for Gilbey, the FA Cup acts as both a welcome distraction from that difficult League 1 table, and also an unwelcome distraction. "It is and it isn't," he said. "It helps it's the FA Cup next week so we can be fresh for the league again, but we want games thick and fast. "No disrespect to the teams coming up, but they are winnable games and we have ot win them so that's what we're looking for."